The empty capsule market has become increasingly integrated and consolidated over the last few years and is now dominated by a very few multinational companies. Mergers are driven by a need to increase competitiveness and a consolidating customer base has been a recurring theme over the past decade. In addition, prices in China have raised with stricter production standards and more inspections that were imposed after a number of commonly made drugs in China were packed into capsules made from the industrial rather than the edible grade of gelatin near the start of 2012. In order to increase the production capacity and further enhance the quality and range of its vegetarian capsule, Capsugel invested USD 25 million. Goldstein Research analyst forecast the Empty Capsule Market size is set to reach USD 2.12 billion by 2024, at a CAGR of 7.0% over the forecast years. Growing Asian and South American demand along with the likelihood of rising prices going to change the whole picture of the empty capsule market. The report covers the present ground scenario and the future growth prospects of the Empty Capsule Market for 2016-2024 along with data related to the manufactured units of empty capsule. We calculated the market size and revenue share on the basis of revenue generated from major players across the globe. The market forecast is done on the basis of gelatin based and non-gelatin based empty capsules and their application in antibiotic & antibacterial drugs, vitamin & dietary supplements, antacids & anti-flatulent preparations, anti-anemic preparations, anti-inflammatory & anti-rheumatic drugs, cardiac therapy drugs and cough & cold preparations. In 2016, the gelatin capsules segment accounted for the maximum revenue share of over 80% and are expected to continue its market dominance over the forecast period while non-gelatin based empty capsules tends to grow in a lucrative manner at a CAGR of 7% over the years due to its better stability and vegetarian origin that circumvent religious issues associated with capsules of animal origin. Empty Capsule Market Outlook 2016-2024, has been prepared based on an in-depth market analysis from industry experts. 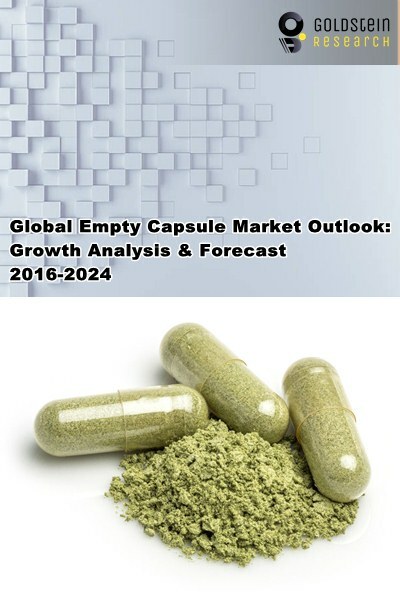 The report covers the competitive landscape and current position of major players in the global Empty Capsule Market. The report also includes porter’s five force model, SWOT analysis, company profiling, business strategies of market players and their business models. Global Empty Capsule Market report also recognizes value chain analysis to understand the cost differentiation to provide competitive advantage to the existing and new entry players. Our global Empty Capsule Market report comprises of the following companies as the key players: Capsugel, Inc., ACG Associated capsules Pvt. Ltd., JC Biological Technology Co. Ltd, CapsCanada Corporation, Medicaps Ltd., Qualicaps,Inc. (Mitsubishi Chemical Holdings Corporation), Patheon,Inc. (Banner Pharmacaps, Inc.), Roxlor LLC, and Sunil Healthcare Ltd.(Sunloc Healthcare, Inc.). According to the report, major driving factor for empty capsule market is the demand for innovative drug delivery formulations in the pharmaceutical industry and increased consumption of dietary supplements. For example, 68% of the Americans take dietary supplements that has remained consistent over the past five years as it impact their overall health, fill the nutrient gap and help maintaining energy and immune health. Further, the report states the major challenge is prices have risen due to the drought in Russia and the US may be leading to a fall in the number of the animals from which gelatin is produced. Further animal welfare reforms in the EU from the start of 2013 are also likely to reduce the size of the pig herd. Rising demand for leather and a shortage of pigskin and animal bone has caused increasing problems and led to the closure of some factories unable to obtain sufficient raw material. This has led to a slowing in the rate of supply increase. Based on geography, North America leads the market with 49% of the total empty capsule market share owing to rapid evolution of the pharmaceutical and nutraceutical industries as a result of aging populations, rising income levels, increasing awareness of personal health, easy access to high-quality healthcare facilities and favorable government initiatives. APAC tends to grow at the fastest rate, registering the CAGR of 7.1% over the forecast period and is the opportunistic market for the empty capsule vendors due to increasing pharma based and cosmetic based ventures. What is the revenue of Empty Capsule in 2015-16 and what would be the expected demand over the forecast period?